I have to admit to a guilty pleasure that Halloween has become so damn popular. Who would have thought that in 2009 the local stores would have thousands of square feet dedicated to cool decorations, costumes, even specialty household items like skull place mats and dragon dishcloths. I hauled out the 3 crates of decorations and my trusty SS ATR got the nod for cutting the zip ties, opening packaging, prepping the outdoor trees and shrubs, etc. 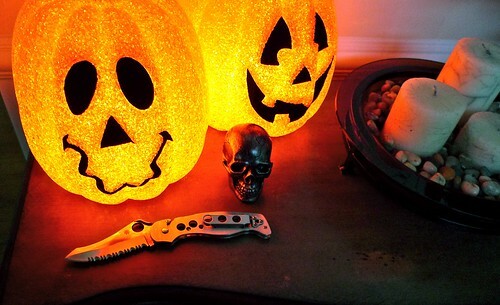 The Serrated Edge ATR is a bit like Halloween: Scary and Cool.